The WMS (Warehouse Managements System) encompasses the core components within average Microsoft Dynamics AX installations that are implemented to manage and run world class warehouses. The WMS functionality is enabled by the configuration keys LogisticsAdvanced, WMSBasic, and WMSAdvanced. Formal training is available with the courses “Trade and Logistics I in Microsoft Dynamics® AX 2009” and “Trade and Logistics II in Microsoft Dynamics® AX 2009”. The training material covers main flows and processes, but there is still plenty of room for discussions on this exiting subject. Please welcome the first post of a WMS series on this blog. In Microsoft Dynamics AX 2009 outbound shipping via warehouse management is processesed through a shipment [Inventory management > Common Forms > Shipments]. A shipment is a collection of items that are packed in the same container for transport by, for example, ship, rail, truck, or plane. A shipment includes an entire order, a part of an order, or a consolidation of multiple orders. Based on the contents of the shipment, one or more picking routes, one or more pallet transports, or both are created. 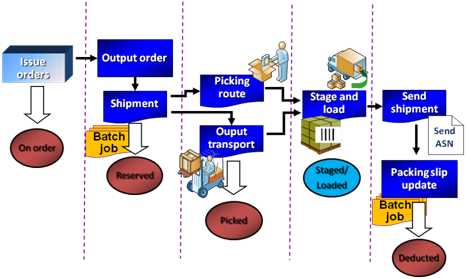 An output order is a request for a picking requirements and it forms the basis of a shipment. From the shipment you can activate a pallet transport, a picking route, or both. The shipment status is based on the lowest denominator of the shipment lines’ status. When, for example, a sales order line is created in Microsoft Dynamics AX 2009 an inventory transaction is created with a negative quantity to control an expected issue of inventory. To control the process of issuing the physical inventory, an output order is used in the warehouse management area. The output order [Inventory management > Inquiries > Output orders] is created when the reference order is released (Posting of the picking list). The output orders are associated with a shipment, and in that process Microsoft Dynamics AX 2009 creates shipment lines. When shipment reservation is run, the program creates picking routes and/or output pallet transports based on predefined settings. The following activation of the picking process makes it possible to pick and deliver picked inventory to the shipment staging areas where the shipment is staged and loaded before it is sent. As shown below, the outbound process can be set up to include only part of the existing stages. In Microsoft Dynamics AX 2009, the warehouse management outbound processes use output orders [Inventory Management > Inquiries > Output orders]. The output order [Inventory management > Inquiries > Output orders] is created when the reference order is released (Posting of the picking list), or when a manual output is requested from the issue reference line. The output order holds information about the status of the outbound process and it is linked to the detailed information of the issue reference line. When the output order is created, it takes “ownership” of corresponding issue inventory transactions. This relationship is maintained by two dedicated fields on the InventTrans table (TransChildType and TransChildTypeRef). All related inventory transactions are marked consistently against an output order. Consider the following code example of output order creation. A shipment consists of a shipment header and lines, and the information relates to output orders which, again, relate to the different reference order lines. Note, that when using advanced warehouse management in AX, a shipment can contain references to multiple issue orders, and these orders can even be of different order types. The shipment has been created but not yet reserved or, if just one shipment line exists, without being part of a route. The shipment has been reserved and picking routes and/or pallet transports have been generated, but they have not yet been released for picking. Both picking routes and pallet transports have been released, but not all of them have been completed. Note that picking can start even when all items for the shipment cannot be reserved. At least one line of the shipment line is still at the picked stage. At least one line of the shipment line is still at the staged stage. At least one line of the shipment line is still at the loaded stage. The shipment has been sent and the shipment has been fully expedited. A Shipment template available from Inventory management > Setup > Distribution > Shipment templates, is used as the basis of a shipment. A shipment template is required only if features such as automatic shipment creation, automatic creation of output orders, or creation of shipments via a wizard are applied, otherwise a shipment can be created manually. When a shipment template is applied, output orders can automatically be assigned to a shipment – and then a shipment need not be created manually. The order picking and consolidated picking processes use the same framework, called output orders, but the consolidated picking method has much more functionality and it requires a license to Advanced Warehouse Management. If consolidated picking is not applied, Microsoft Dynamics AX 2009 automatically creates a shipment and a picking route when, for example, a picking list is posted from the Sales orders form. We do not recommend using inventory transaction picking in combination with one of the other picking methods since inventory transaction picking does not update output order related information. The following example illustrates the possibilities of controlling the outbound warehouse management processes utilizing output orders in Microsoft Dynamics AX. Consolidated picking implies that multiple orders can be combined into one picking list. The orders can potentially be of different types, for example sales orders or transfer orders. Consolidated picking uses advanced shipment functionality such as reservation via shipment, activate picking, activate pallet transport, and guided picking routes. 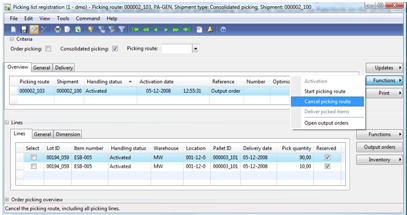 In Microsoft Dynamics AX 2009 inventory can be unpicked and returned to a different inventory dimension as, for example, a location and/or pallet. The inventory transactions are returned to the original status after an unpick operation has been performed. The reference to the output order still exists, and the picking line can be updated to Picked again right after unpicking. When a picking line is canceled, the output order reference is moved to the issue reference line and the output order, therefore, needs to be released again from the issue order. Alternatively, the reference line or the “deliver remainder” quantity on the issue reference line can be canceled. The unpicking and cancelation methods can be found on the picking list registration [Inventory management > Periodic > Picking list registration], lines – Functions. All the picking lines can also be canceled in one operation via Functions on the picking route header. Note that after the unpick action it is still possible to pick the same inventory again and again. Since the historical information is not stored in the system, the final inventory transactions are marked against the latest selected picking route, and the original reference using inventory transactions (TransChildType, TransChildTypeRef) is not valid anymore which means that these fields are empty on related inventory transactions. This aspect should be considered by every partner, who is planning to customize functionality in this area. 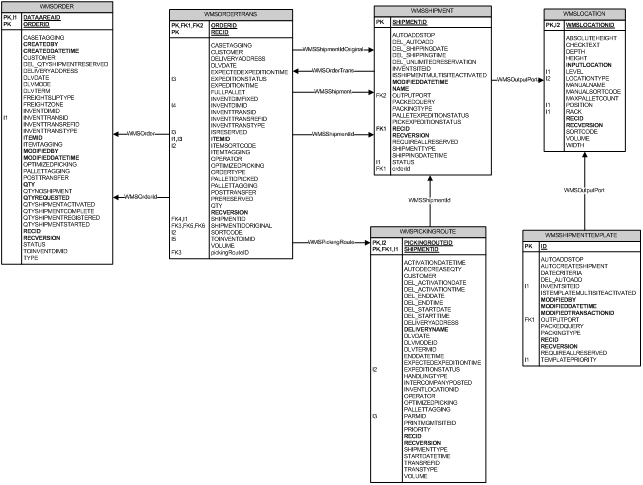 Please look at the following data model which represents the relationships between all entities in the scope of this blog post.